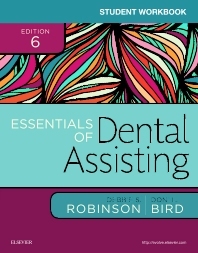 Let this dynamic workbook help you better understand, practice, and apply the information in Essentials of Dental Assisting, 6th Edition. Within the workbook are three main sections: practice questions and exercises, competency sheets that outline the steps necessary to master each procedure in the main text, and removable flashcards that focus on key information for on-the-go study. New chapter questions and exercises for the online Interactive Dental Office case-based program provide enhanced practice and application. All workbook content is organized by chapter to make it easy for you to move back and forth from the main text and easily assimilate and apply content. Chapter-by-chapter correlation with textbook enables users to seamlessly move between the content in the main text and the competency sheets and exercises in the workbook. Chapter exercises utilize short answer, fill-in-the-blank, matching, and multiple-choice formats to help reinforce the learning outcomes, key terminology, and important concepts from the main text. Competency evaluation forms　are included for all procedures, each outlining the performance objective, grading criteria, and steps necessary to master the procedure. Removable flashcards　make it easy to review anywhere, anytime. Perforated pages allow users to remove exercises for classroom evaluation and competency forms for use in clinical evaluation settings.